With spring here and summer sneaking around the corner, it’s time to dust off that hammock that has been sitting in the garage. Or if you don’t already own one, select one from a company such as The Hammock Source that offers a wide range of stylish and durable hammocks. Hammocks have been in use since the days of Columbus in the 1400s, mainly as beds for sailors at sea. While we may not see hammocks in battleships anymore, it’s no surprise that they have become a symbol of relaxation in the summer sun. Swinging in the summer breeze with a good book or tall glass of lemonade is a pastime that has never gone out of style thanks to the hammock. Since hammock season is rapidly approaching, we here at Patio & Hearth Blog offer some tips for purchasing and maintaining your hammock. – To hang a hammock, you need at least 10 to 16 feet of space. If you have less than 10 feet, the slope of the hammock will be too steep, making it uncomfortable to use. 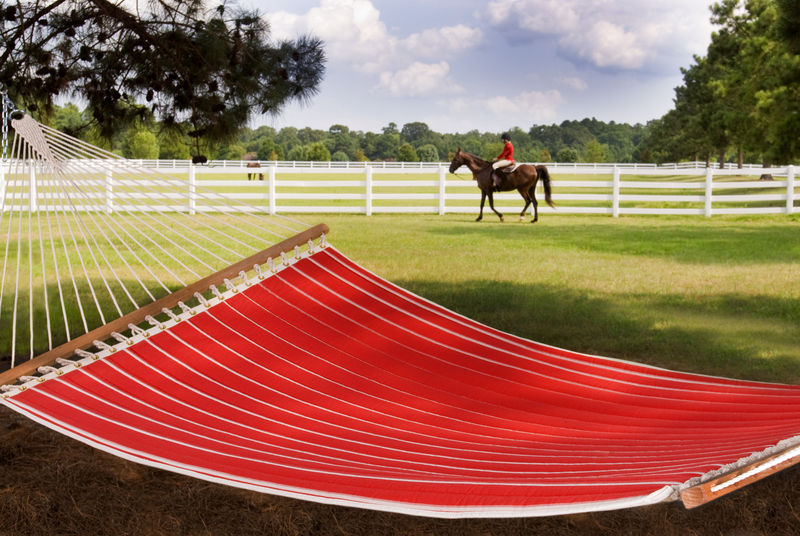 – To clean a fabric hammock, scrub it down with a mild detergent, then rinse it off with a hose. – To clean a rope hammock, place it in a bathtub filled with water and a small amount of bleach. Let it soak and then rinse it off inside the tub. – In general, you should keep your hammock out of weather’s way no matter what its material. If you live in an area where winter is particularly snowy or wet, bring your hammock inside and store it to extend its life. Nowadays, hammocks come in a wide variety of styles, from simple rope hammocks to colorful fabric hammocks.Be sure to find one that fits your relaxation style. For one of the best selections of hammocks, visit The Hammock Source at www.thehammocksource.